There are more than 285 million people worldwide who have vision problems. By the time that they reach 80, more than half of all Americans will have cataracts, and severe vision problems as a result. However, each year brings new advancements in science and technology that help us to combat these issues, and now, people with vision problems may have new hope. The Argus II Retinal Prosthesis System is a retinal implant system that gives people who have gone blind from degenerative eye diseases (like macular degeneration and retinitis pigmentosa) a limited degree of vision. It’s not full 20/20 sight, but it is an amazing step forward, especially considering that one in ten people over the age of 55 suffer from various stages of macular degeneration and, on the other hand, retinitis pigmentosa is a disease that affects about 1.5 million people worldwide. Both diseases damage the cells at the back of the retina, called photoreceptors, which perceive light patterns and sends messages to the brain using nerve impulses, where the impulse patterns are then converted into images. The Argus II system takes the role of and replaces these photoreceptors. Ultimately, as the above video demonstrates, there are a number of devices that are being developed to help the blind see. But let’s delve into Argus II a little more to see exactly how one of these systems works. To begin, the company Second Sight’s retinal prosthesis has five main parts. Understanding the components essentially tells you how the tech functions. 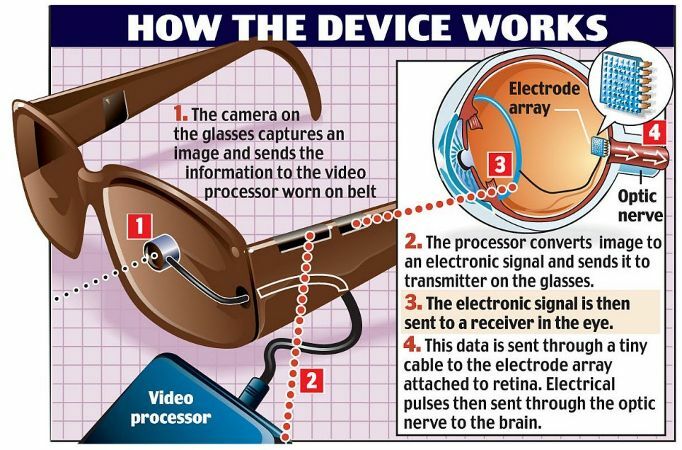 A digital camera built into a pair of glasses, which captures images in real time to be sent to a microchip. A video-processing microchip, which converts images into electrical pulses representing dark and light patterns, which are then sent to a radio transmitter in the glasses. The radio transmitter, which wirelessly transmits pulses to a receiver implanted near the ear or eye. The receiver, which sends the pulses to a retinal implant through an implanted wire. A retinal implant consisting of an array of 60 electrodes on a chip measuring 1×1 mm. The video processing unit runs on a battery pack. When the camera observes an image, the image is initially made up of dark and light pixels. These pixels are sent as electrical pulses, eventually reaching the visual center of the brain as neural signals. The brain, ideally, interprets these signals the image that is presented. So if the person is looking at a tree, then the brain will interpret the signals that are received as a tree, although it may take some training for subjects to actually see a tree. At first, the person only sees light and dark spots. But after some time, they learn to understand what the brain is showing them, and they eventually recognize that the pattern of light and dark is a tree. Researchers are already planning a third version of the system, Argus III, that has a thousand electrodes on the retinal implant, which they hope will allow for facial-recognition capabilities.